"Music and craft are two central elements in my life." After two years at Music College I was lucky enough to be able to unite these two elements and become a musical instrument maker. I went to London where I completed my training as a maker of early fretted instruments, specializing in violas da gamba. 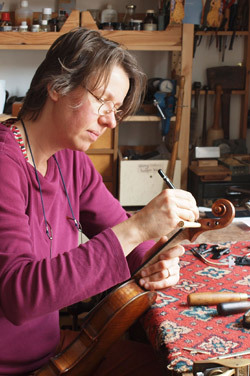 While working for several leading workshops in England and Germany I acquired and deepened my skills in repair and restoration of the violin family instruments. Through my own music making and through meeting numerous amateur and professional musicians I understand what it is that a musician expects of a good instrument. I constantly strive to do justice to the high expectations a musician has of my work. Amongst others my instruments are played by Markus Kröll, Ibi Aziz, Jennifer Bullock, the 'New London Consort' and 'Musicians of the Globe' under Philip Picket.